A woman fascinated by vintage clothing who decides to start wearing a corset on a daily basis is a book subject that would naturally interest me. Rachel, my first-person narrator, travels to 1815 and starts wearing a corset (along the rest of the period-appropriate outfit), and I am curious about how that must have felt to her. (Though not enough to actually dress up like that.) Even if the author’s corset — the waist-squeezing, hourglass-figure-imposing kind adopted in the 1830s and worn for the better part of the next century — is different from the c. 1815 model, which left the waist largely as it was, there still must have been a sense of confinement and required uprightness alien to our elasticized age. What would that be like? What practical problems would the author encounter? So when I found a review copy lying around the office, it vaulted to the top of my to be read pile. “Victorian Secrets” by Sarah A. Chrisman was fascinating, although not in the way I expected and probably not in the way its author intended. It is chiefly fascinating, alas, as a psychological study, and an admonition about the risks of memoir. Not that the stuff about corsets isn’t interesting — it is. And yet. And yet. Instead I was left with the impression as I read this book that for its author, other people do not really exist, not with the same reality and forcefulness that she, herself, does. Everyone else, even her husband (who shares her penchant for vintage clothing and gives her as a birthday present the corset that sets this adventure in motion) matter only to the extent that they impinge upon her. People who admire her outfits, compliment her posture or want to talk about the Victorian era suffuse the author with a warm glow of self-satisfaction. Those who accidentally step on her petticoats, scold her for endorsing female oppression, wear less-than-authentic Victorian garb or want to use a public bathroom that she has pressed into service as changing room during a vintage fashion show groan under the lash of her scornful prose. There is no in between, and seemingly no awareness that people who, for example, urgently need to use a bathroom or choose to wear Victorian-style clothes made of synthetic fibers might have problems of their own, might not have come into the world solely to vex and oppress Sarah A. Chrisman. Though frequently shocked by the self-righteous attitudes of those offended by her choice of foundation garment, who stare, point, or lecture her about dangers of tight-lacing, the author seems unaware of her own self-righteousness, to sometimes comic effect. But, it’s a memoir. Isn’t the whole point of a memoir — that is about oneself? The form is inherently egotistical. So what’s wrong? I recognize the critical problem here as one of narrative voice. Autobiography, memoir and confession (as well as novels that are written in a similar style, and indeed really all first-person narrated novels) live or die by the voice. There is a complicity going on between reader and narrator, which can work in various ways, but the premise always the same: something that enlists the reader, compels him or her to keep reading. To choose an extreme example, the narrator of Nabokov’s autobiography “Speak, Memory” is unapologetically superior to and far smarter than nearly all of his readers. Reading this book as an 18-year-old student, I felt the vast gulf between my own ordinary life with its slight accomplishments and that of this handsome, brilliant, aristocratic and doubly exiled Russian. Yet he had me on his side from the first sentence: (“The cradle rocks above an abyss, and common sense tells us that our existence is a brief crack of light between two eternities of darkness.”) How did he do that? The shortest explanation, I suppose, can be gleaned from that very sentence: our existence. Nabokov tells us the story of his first two decades in this book, but he starts with a comment about the wider human condition, the reality we all share: that we will die. It doesn’t get much simpler, or more universal, than that. Nabokov makes no attempt to conceal or play down his unusual abilities or his privileged childhood, but his language wins us over all the same. Here’s a provocative notion, though scarcely an original one. Writers, whether of novels, memoirs, or 750-word accounts of local city council meetings, are by their very nature crazy egotists: They think their thoughts or insights are more interesting than the common run, and need to be shared with the world. Yet many of the ones people enjoy reading manage through some rhetorical tricks to hide this, to adopt a pose of something else that keeps the reader feeling connected, as if we are on the same side of a divide. I was about to offer “Julie & Julia” as a better comparison than “Speak, Memory” to “Victorian Secrets”: in both books, a young woman takes on a stunt and writes a book about it. I read “J&J” shortly after it came out and found it hilarious in its profane, food-geeky way. The voice of Julie Powell in this book won me over. But when I went to Amazon to check whether it was really “Julie & Julia” or actually “Julia & Julie,” I was struck by how many reviewers really hated it (though many, like me, also liked it), giving it one-star reviews with reactions similar to the one I’ve had reading “Victorian Secrets”: that the author, based on how she wrote, just seemed to them someone they would not like. So there you go. One half of the world cannot understand the pleasures of the other. 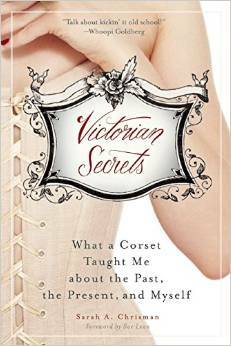 I did glean a lot of corset lore from “Victorian Secrets” (which is due out in November from Skyhorse), and no doubt others will find the narrative voice more pleasing than I did. I wish them the pleasure of it, and the best to its author. I was curious whether others shared the same view, so I Googled “victorian secrets chrisman review” and found your blog. I was really interested in the subject matter but completely shocked by the belittling way she speaks about almost everyone else in the book. I hope nobody she interacted with reads it, because I can imagine they would be crushed by how they are depicted. And comments like that the “idiot” bus driver deserved to be stabbed with her hatpin and had a “low-class Southern accent”– good grief, what is the point of dressing up like a lady if you’re going to talk about real people that way in print? Like you, I’m an author, and I usually don’t make negative comments about other authors online as a professional courtesy. But I felt awful for the people she slammed in this book. It detracts tremendously from the worthwhile information in the book. PS: Sorry if this appears multiple times. It’s giving me a hard time with posting. Thanks for your comment, Ariake. I hesitated a lot before writing my thoughts on this book — like you, I found the subject matter compelling but the author’s self-centered and contemptuous approach to the world was what really transfixed me. And this was not self-published! People had to have read this book while it was in process: editors, her agent, right? I read on another blog that it was originally self-published, which would explain why she might not have realized her tone was so– as you say– contemptuous. But having been through the traditional publishing process myself, I found myself repeatedly surprised that her editor let it go through like this and didn’t sit down and have a come-to-Jesus talk with her about tone. If it were any other subject matter it still would have been grating to hear her talk that way about others, but the idea that it’s a book about becoming a Victorian lady made it that much more perplexing. Scarlett O’Hara was catty and nasty toward others too, but those were supposed to be qualities that were *at odds* with her attempts to be a Victorian lady. I would have felt more forgiving if she’d had some self-awareness about it and admitted that this was a quality that she needed to work on in her journey toward becoming her true, ladylike self, but instead it seemed she expected me to be sympathetic to her belief that it’s more important to have your petticoat intact than to treat a bus driver with human decency. Yes, the perfect description! A come-to-Jesus talk was what was called for here.